Ok, now back to the lippies! Urban Decay’s Vice Lipsticks come in 100+ shades (a couple of which are on sale right now at Sephora for only $8.50 USD, vs $17, their original price). Being at the forefront of the latest makeup trends, you can find pretty much any shade – from deep blues and lilacs, bright tangerines and fuchsias, and even a black shade with pink shimmer! There are quite a few neutral tones in the collection as well – like beiges, browns, and mauves – if you prefer a more everyday wearable look. That’s where I tend to fall at least, which is why I’m loving all five of these shades – from the deep matte 90’s brown, to the semi-sheer flirty frosty peach. As far as pigmentation goes, the one cream and three comfort matte shades I tried all live up to Urban Decay’s claim – they provide rich, full coverage in just one swipe. The one metallized shade (Gubby), however, is more of a semi-sheer shade (it took me three swipes to build up to the swatch you see above on my arm, whereas the others took only one). For that reason, it actually works quite well as a shimmer top coat, especially over the matte shades. Backtalk (my favorite comfort matte shade) + Gubby, for example, makes for a gorgeous combo! The feel of the formula definitely ranges on the finish, though one thing they do have in common (from the ones I’ve tested so far) is that they apply smoothly and evenly, and very much ‘comfort’ the lips while feeding them with a touch of moisture, thanks to ingredients like aloe vera, jojoba, avocado and babassu oils. My favorite finish has to be the cream – it feels extra hydrating, provides full coverage color, and also gives the lips a subtle, healthy looking shine. The comfort matte is my second favorite. For a matte, is feels amazingly ‘cushiony’, flexible, and silky – never dry. It manages to smooth and soften my lips, providing even color with zero streaking, pulling, patchiness, or cracking, even after several hours of wear. The trade-off though is that they’re not 100% matte – they do have a slight sheen to them, making them more satin-like. Each lipstick is packaged in a sleek faceted gunmetal case with a shade-matched label on the bottom, to make it a bit easier to pull out the right color from your makeup bag/organizer! 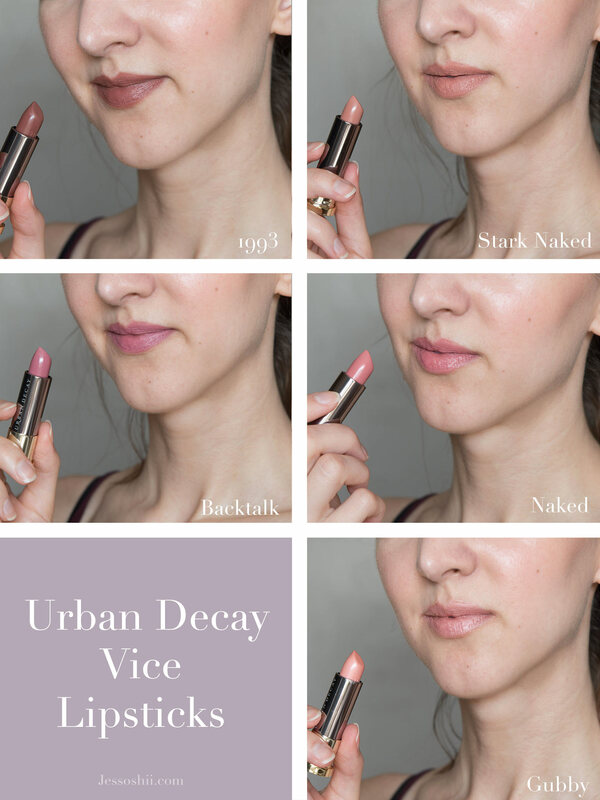 Have you tried the Urban Decay Vice Lipsticks? If so, do you have a favorite shade? If not, do you think you might try one?